The most commonly used Geomantic chart, the Shield Chart (conveniently labeled in that link), is divided into five distinct sections, each section with the same general structure. 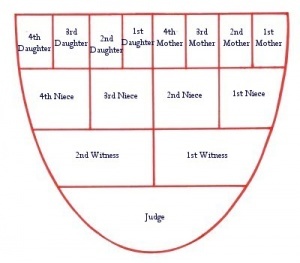 Looking at the Geomantic Shield Chart, these sections are visible as groupings of three boxes: the first and second Mothers and the first Niece, the third and fourth Mothers and the Second Niece, the first and second Daughters and the Third Niece, the third and fourth Daughters and the Fourth Niece, and the Left and Right Witnesses and Judge. Each of these sections, the first four of which are called “Triplicities” and the latter of which is merely known as “The Judge and Witnesses.” Each area of the Chart helps to shed insight on a particular aspect of the question asked. As stated above, each of the Triplicities has a distinct structure. Looking at the chart from the bottom down (in the same way that you read the chart), it becomes apparent that two elements from the first row combine to form a larger element in the second row; i.e., two Mothers or Daughters form a niece. When the Shield Chart is generated, the same two first-row Figures are the ones who generate their associated Niece, and so each Triplicity is linked from the very moment of generation. In terms of reading a Triplicity to try and understand its meaning, each one is treated in the exact same way. The Nieces in each Triplicity represent the relationship between the two Mothers or Daughters below it, as well as influences on the present and as a summary of the Triplicity as a whole. The right Daughter or Mother represents the influence of the past and of the person asking the question, while the left Daughter or Mother represents the effects of the subject of the question, as well as a likely course for the future. The Judge and Witness are not technically a Triplicity, but they have the exact same structure (with the Judge acting as a Niece and the Right and Left Witnesses like Mothers or Daughters). The Judge and Witnesses taken together represent the sum of the question being asked; the Right Witness represents the overall influence of the past and of the one asking the question, while the Left Witness represents the possible future and the effects of the subject of the question on the chart as a whole. The Judge serves to represent a summary of the present, and of the relationship between the two Witnesses. The Judge also serves as a summary of the chart as a whole, and can be used to quickly sum up a reading. As a group of three Figures, the Judge and Witnesses represent the question as a whole, and as a summary of the four Triplicities. The First Triplicity, made of the first and second Mothers and the first Niece, as a whole represent the querent, or the person asking the question the chart is attempting to answer. It represents everything that the querent brings to the table: backstory, attitudes, status, perspective, belongings, energies, and anything else. The first Niece serves as a brief summary of this influence, and also represents the relationship between the Mothers and the present situation. The first Mother represents the querent’s past, and the second Mother represents the querent’s future and the influence of the subject of the question on the querent. The Second Triplicity, made of the third and fourth Mothers and the second Niece, as a whole represent the events that have a bearing on the reading. The Niece serves to summarize these events in the present, and sheds insight on how the events of past and future (third and fourth Mothers respectively) are related. The third Mother can also represent events directly involving the querent, and the fourth Mother can also represent events directly relating to the subject of the question (sometimes called the quesited). The Third Triplicity, made of the first and second Daughters and the third Niece, as a whole represent the home. It represents the influences that the querent’s home and work environment’s might have on the querent and the question. Environments, family, and very close friends influence this Triplicity, which is summed up by the Niece, who also represents the relationship between the first and second Daughters. The first Daughter often represents, as usual, the past influence of the home, but also can represent the influences of one’s environment. The second Daughter represents the future, as well as the influences of the people close to the querent. The Fourth Triplicity, made of the third and fourth Daughters and the fourth Niece, as a whole represent society. It represents the influence of your larger culture, your acquaintances, your friends who are not very close, and figures of power. The Niece, as always, sums up this influence and helps describe how the third and fourth Daughters relate to each other. The third Daughter represents not only the past, but also the influence of society on a micro level; your friend’s social circle, for instance. The fourth Daughter represents the future as well as the influence of larger cultural trends that have an impact on your life. While the above Triplicities are the only “accepted” Triplicities of the Shield Chart, I personally also make us of two “Sub-Triplicities.” The first of these Sub-Triplicities is made up of the first and second Nieces and the Right Witness. The second of these Sub-Triplicities is the third and fourth Nieces and the Left Witness. Like the other Triplicities, the two Nieces derive the Witness. I read both Sub-Triplicities like I would read any other Triplicity, with the Witnesses serving as a summary, the present, and the relationship between the two Nieces. The Sub-Triplicity of the Right (Witness) represents the Querent, and the first Niece represents the querent and his past, while the second Niece represents the events that might affect the querent and the querent’s future. The Sub-Triplicity of the Left (Witness) represents the Subject of the Question, with the third Niece representing the past and one’s home, and the fourth Niece representing one’s culture and future. Essentially, I read each position in the same way as above, but in a different combination, to help shed light on the rest of the spread. An easy and useful way to look at the Shield Chart is as a constant division; the Judge becomes the Witnesses, the Witnesses become the Nieces, and the Nieces become the Mothers and Daughters. By looking at the two “lesser” positions that make up the larger one, in all cases yields a better understanding of the larger one. This entry was posted on June 11, 2012 by Z. M. Wilmot. It was filed under Geomancy .